Gain greater insight into your organisations’s business performance with Infor d/EPM. 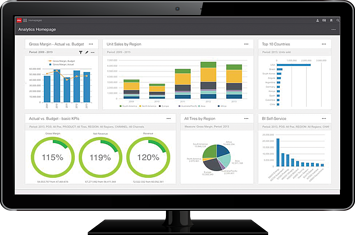 Infor d/EPM combines modern intelligent business tools with financial performance management. The Infor d/EPM platform incorporates budgeting, planning, consolidation, forecasting and analysis to provide detailed insight into an organisation’s business performance. With Infor d/EPM, organisations can gain greater insight across their whole business to make better decisions and maximise performance. Build your operational planning, workforce budgeting and sale estimates. Create deep plan hierarchies, compare plans to forecasts, and adjust plans on the fly. Task management, decision packages, workflow, and versioning capabilities bring a new level of discipline and flexibility to your budgeting processes. Consolidate multiple sets of books quickly and seamlessly from each of your legal entities, process elimination entries, and generate a single set of financial statements. Plan your business using predictive analytics and powerful forecasting capabilities to drive strategic, tactical, and operational decisions. Map out your strategic goals, tie them to your tactical plans, monitor progress toward your goals, and take action. Analyse data to find out which activities are productive, and which are unproductive. "I’m pleased that Kempinski can ensure that accurate financial decisions can be made round the clock, anywhere in the world, on any device".